Can you believe we never had visited Las Vegas until recently? After years of putting it off, we finally got there on a recent road trip. Although we aren’t gamblers, we found there were many things to keep us entertained outside the casino. More important, we had a total blast. We arrived in Vegas via Death Valley. In summer, this is one hot desert with temperatures reaching 120 degrees. I’m glad that we came from this direction though because our first impression of the city was actually the Red Rock National Conservation Area to the west of the city. We have friends who like to go rock-climbing here, so we made sure to take a tour of the park ourselves. We opted for a short hike to check out some views. It’s an incredible landscape that everyone should make a point of seeing while taking a holiday in Vegas. After a few hours of hiking in the heat, we were happy to make our way to the city and seek shelter in some air-conditioned casinos. We got all giddy as we drove along the Vegas Strip, recognizing everything that we have seen TV and in the movies. The fountains at Bellagio! The Eiffel Tower at Paris Las Vegas! The Sphinx in front of the Luxor! As proud Canadians, we were thrilled to see Shania Twain and Celine Dion front and center on giant billboards co-headlining at Caesars Palace. We imagined what it must have been like to visit this town during the Rat Pack Days of Frank Sinatra and Dean Martin. Vegas has changed drastically over the decades, but for us, it was all new and exciting. 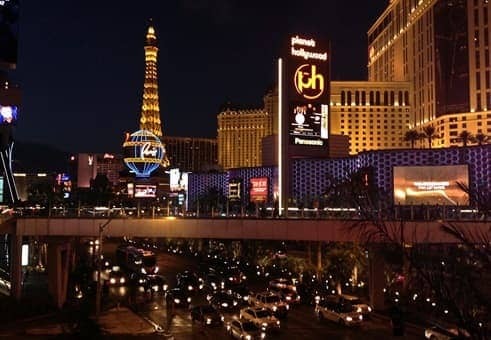 One thing we’ve always heard about Vegas is how far away everything is., how hotels seem like they are closer to each other than they really are. We can confirm this to be true. We’d set out to take a peek at the Luxor or The MGM Grand and find ourselves walking forever to get there. Still, we loved walking the strip and ducking into each hotel to see what it had in store. Also, we’ve been lucky enough to visit many places in the world, and found it fun to compare where we’ve been to the replicas that are found throughout Vegas. Some of the replicas surprised us with their accuracy. The Coliseum, for instance, was as close as you can get to the real deal. The Statue of Liberty, out in front of New York-New York Hotel & Casino, is an icon, just like it is in New York Harbor. I think the best replica is definitely The Venetian; we really felt as if we were in Venice. The place has gondoliers! And the Rialto Bridge! It really is the closest thing you’ll ever get to a Venice experience without actually having to go there. Viewfinder Tip: Joining casino players’ clubs usually gets you coupons and comps for free stuff. The bottom line: Vegas is truly a sight to behold. Unlike the popular marketing campaign, what happens in Vegas doesn’t stay there at all, which means you’ll have some wacky travel memories to last a lifetime..
How do you prepare for your first visit to a new place?